A Singer sewing machine can be threaded by using a thread guide at the top. Here are step-by-step instructions to thread this machine using a single- or a two-part thread guide. Find out whether you have a Singer sewing machine with a single-part thread guide or a two-part thread guide. Of these, a single-part thread guide, made of metal, that is found at the top of the machine. A two-part thread guide is made up of a two-piece, a long plastic piece, and a small metal piece, atop the machine. The thread is passed through both pieces before it enters the eye of the needle. 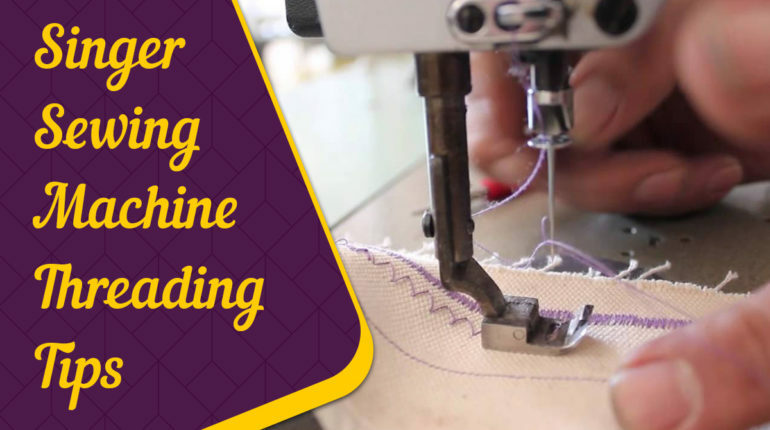 To get the most secure and firm stitches, it is crucial that you thread your sewing machine the correct way. 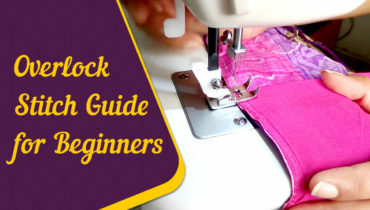 True, the market is flooded with a variety of models and sizes of sewing machines, yet the mechanism for making a stitch on your Singer sewing machine still remains the same. All you need do is to form stitches by uniting the needle thread with a second strand of thread that is released from the machine’s bobbin. 1. Switch off the power and unplug the machine so that it doesn’t remain on while you go through the process of threading it. Elevate the needle to the maximum level. Rotate the hand wheel towards you till the needle cannot be elevated anymore. 2. Elevate the foot presser and hold the small lever near the foot presser and elevate it. Place a reel of thread onto the spool pin. Does your sewing machine have a horizontal spool pin? If yes, then you will have to cover the spool with a cap to hold it firmly in position. However, if it has a vertical spool pin, let the spool rest on the pin. 3. Let the thread pass through the thread guide. Here, you will have to pull it on to the left of the guide and let it go under the small hook and rest in an insert that resembles a keyhole. 4. Now, take the thread around the tension mechanism. Let it enter the threading channel and get set on to the tension discs. Pass the thread through the eye of the take-up lever. Now, let the same thread go under the hook and then into the eye, where it will remain firmly in place. 5. Next, thread the guide that’s directly above the needle. Thread the needle and let the thread pass from front to back. 1. Turn off the machine and ensure that electricity does not pass through the sewing machine before you set out to thread it. If the power is on, you may hurt yourself while threading the needle. 2. Elevate the needle to the maximum position. To do this effectively, turn the hand wheel in your direction. Raise the foot presser and hold the small handle on one side of the machine so that the foot presser is raised and the thread passes through some parts of the machine. 3. Place a reel of thread on the spool pin. Pass the thread through the first thread guide. Locate the slot below the thread guide and, from there, let it enter the upper slot. Make the thread take a right turn and pull it through. 4. Now, push the thread through the second thread guide. Allow the thread to make a right turn and go below the guide. Now, insert the thread from the bottom and over the top. Position the thread firmly in place. 5. Let the thread now pass right around the tension mechanism. Lead it into the thread channel and allow it to get onto the tension discs. Now, thread the eye of the take-up lever. Let the thread go under the hook and into the eye and ensure that it stays in place. 6. Pass the thread through the guide a little above the needle. You can identify it as a small hook that holds the thread tautly. Now, pass the thread through the eye of the needle and lead it from front to back. 1. Lower the needle and let the end of the thread pass through the needle so that its tail is at least two inches long. Turn the hand wheel so that it moves near you and the needle enters the bobbin case. 2. Lift the needle and let the hand wheel move until it slowly reaches its former elevated position. Hold on to the thread that tailed off from the needle during this process. When the needle is elevated, so will the loop of the bobbin thread. 3. Now, arrange the thread so that the thread is near you till you bring out a little more of the loop from the bobbin case. Gently tug at the strands of threads till they are firmly under your foot presser. Take the ends of the threads to the back and then to the right of the sewing machine. Your sewing machine is now ready for use. Clean and oil your sewing machine before you use it. 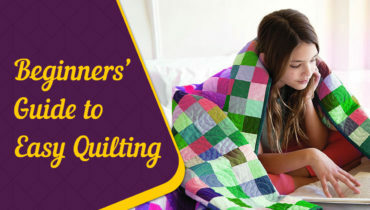 Whenever you use it, begin by sewing slowly and gingerly to test out the machine. Use scraps of material to try out a straight line and proceed only if you meet with 100% success. Use high-quality thread so that lint does not develop in the machine. Are your stitches uneven? It only means that the tension in your machine needs to be readjusted. If you use the machine often, remember to change the needle regularly. Begin by doing small projects and concentrate on learning to match your sewing machine’s settings and speed. Your sewing machine has its own threading requirements. Read the manual and follow the instructions given therein. Also, refer to the threading diagram provided in the manual.